A ladder 15 metres long just reaches the top of a vertical wall. 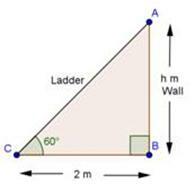 If the ladder makes an angle of 60° with the wall, find the height of the wall. A 1.6 m tall girl stands at a distance of 3.2 m from a lamp-post and casts a shadow of 4.8 m on the ground. 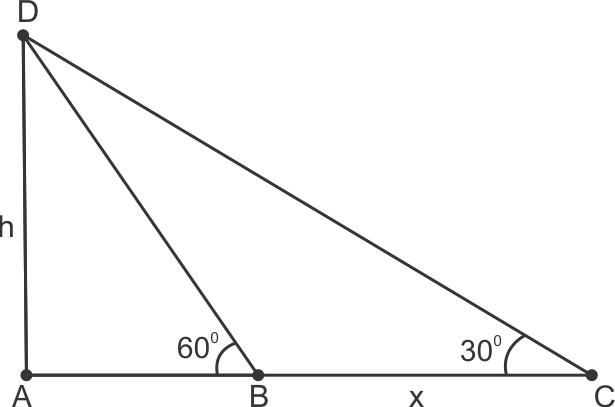 Find the height of the lamp-post by using (i) trigonometric ratios (ii) property of similar triangles. A 1.5 m tall boy is standing at some distance from a 30 m tall building. The angle of elevation from his eyes to the top of the building increases from 30o to 60o as he walks towards the building. Find the distance he walked towards the building. 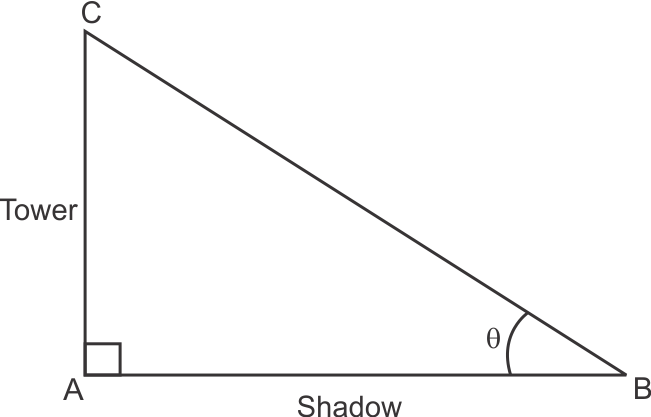 The shadow of a tower standing on a level ground is found to be 40 m longer when Sun'saltitude is 30o. 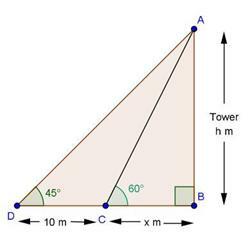 Find the height of the tower. 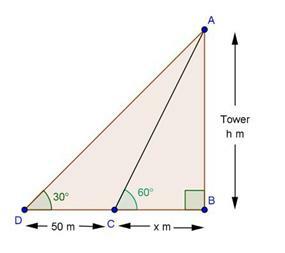 From a point on the ground, the angles of elevation of the bottom and the top of a transmission tower fixed at the top of a 20 m high building are 45o and 60o respectively. 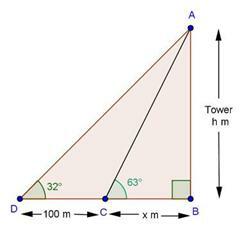 Find the height of the tower. 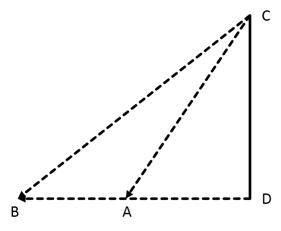 The angles of depression of the top and bottom of 8 m tall building from the top of a multistoried building are 30o and 45o respectively. Find the height of the multistoried building and the distance between the two buildings. A statue, 1.6 m tall, stands on a top of pedestal, from a point on the ground, the angle of elevation of the top of statue is 60o and from the same point the angle of elevation of the top of the pedestal is 45o. 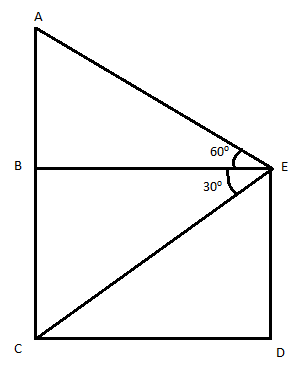 Find the height of the pedestal. A TV tower stands vertically on a bank of a canal. 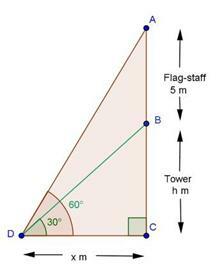 From a point on the other bank directly opposite the tower the angle of elevation of the top of the tower is 60o. From another point 20 m away from this point on the line joining this point to the foot of the tower, the angle of elevation of the top of the tower is 30o. 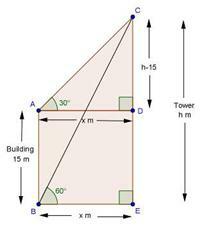 Find the height of the tower and the width of the canal. 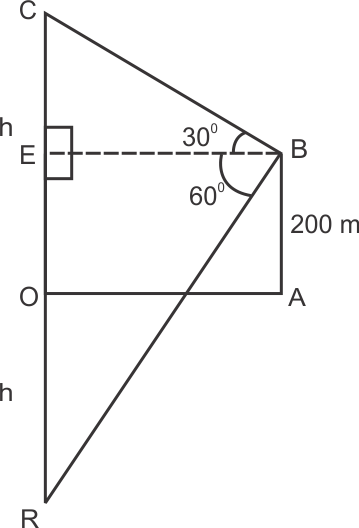 From the top of a 7 m high building, the angle of elevation of the top of a cable tower is 60o and the angle of depression of its foot is 45o. 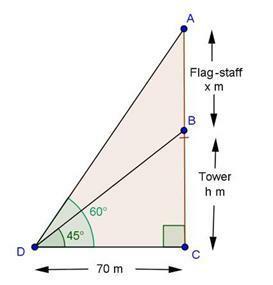 Determine the height of the tower. As observed from the top of a 75 m high lighthouse from the sea-level, the angles of depression of two ships are 30o and 45o. If one ship is exactly behind the other on the same side of the lighthouse, find the distance between the two ships. 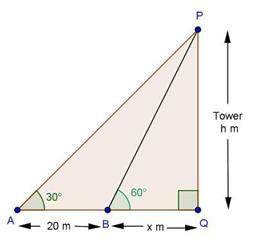 The angle of elevation of the top of a building from the foot of the tower is 30o and the angle of elevation of the top of the tower from the foot of the building is 60o. 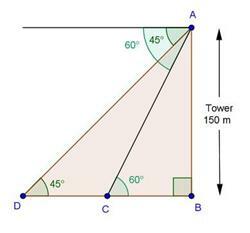 If the tower is 50 m high, find the height of the building. From a point on a bridge across a river the angles of depression of the banks on opposite side of the river are 30o and 45o respectively. 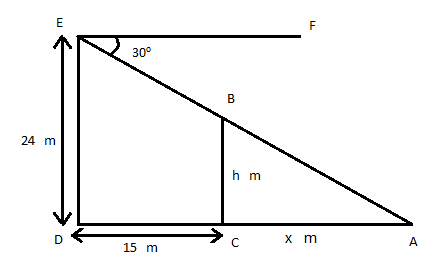 If bridge is at the height of 30 m from the banks, find the width of the river. Two poles of equal heights are standing opposite each other an either side of the road, which is 80 m wide. 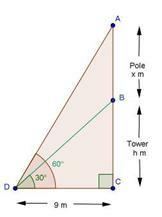 From a point between them on the road, the angles of elevation of the top of the poles are 60o and 30o, respectively. 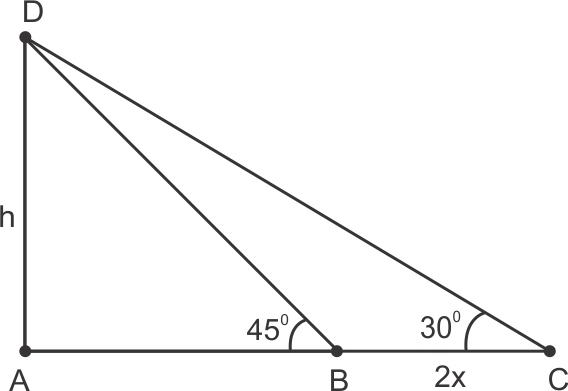 Find the height of poles and the distance of the point from the poles. 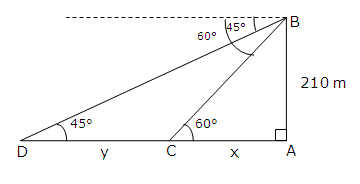 An aeroplane is flying at a height of 210 m. Flying at this height at some instant the angles of depression of two points in a line in opposite directions on both the banks of the river are 45° and 60°. Find the width of the river. 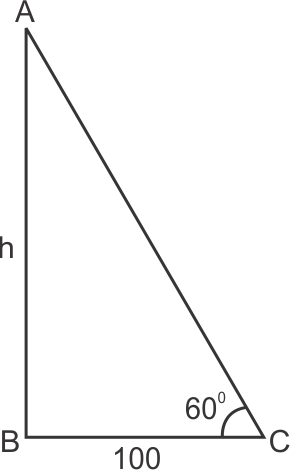 The angle of elevation of the top of a chimney from the top of the tower is 60° and the angle of depression of the foot of the chimney from the top of the tower is 30°. If the height of the tower is 40, find the height of the chimney. According to pollution control norms, the minimum height of a smoke emitting chimney should be 100m. State if the height of the above mentioned chimney meets the pollution norms. 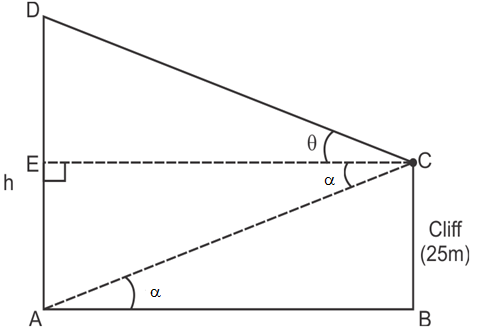 What value is discussed in this question? Let AC = h be the height of the chimney. Yes, the height of the chimney meets the pollution control norms. Two ships are there in the sea on either side of a light house in such away that the ships and the light house are in the same straight line. 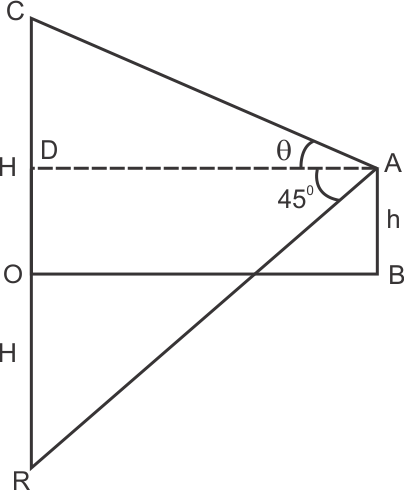 The angles of depression of two ships are observed from the top of the light house are 60° and 45° respectively. If the height of the light house is 200 m, find the distance between the two ships. 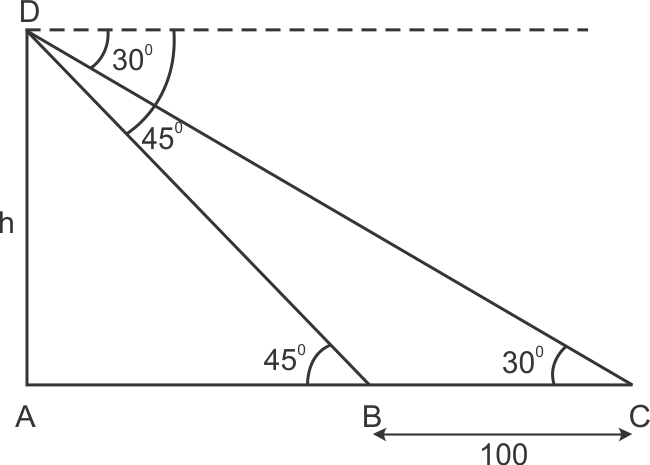 Let the ships be at B and C.
The horizontal distance between two poles is 15 m. The angle of depression of the top of the first pole as seen from the top of the second pole is 30°. 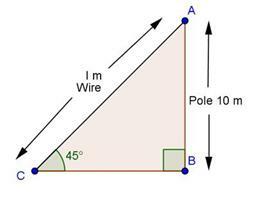 If the height of the second pole is 24 m, find the height of the first pole. Here m∠CAB = m∠FEB = 30°. 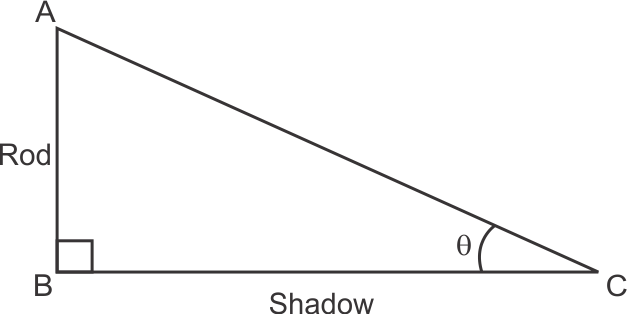 The angles of depression of two ships from the top of a light house and on the same side of it are found to be 45o and 30o respectively. If the ships are 200 m apart, find the height of the light house. 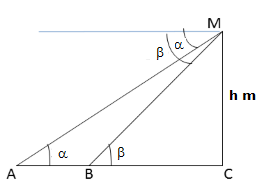 (i) the horizontal distance between AB and CD. (ii) the height of the lamp post. (iii) the difference between the heights of the building and the lamp post. ΔA moving boat is observed from the top of a 150m high cliff moving away from the cliff. The angle of depression of the boat changes from 60˚ to 45˚ in 2 minutes. 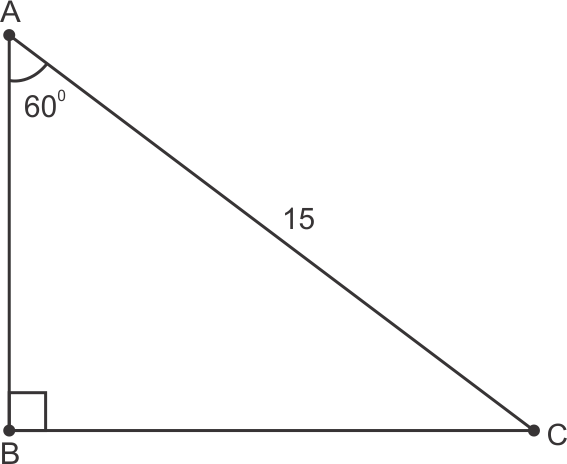 Find the speed of the boat in m /h. 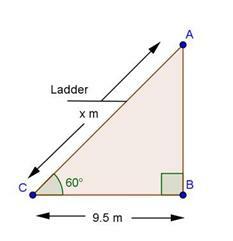 Let AB be the cliff, so AB=150m. C and D are positions of the boat. DC is the distance covered in 2 min. From the top of a 120 m high tower, a man observes two cars on the opposite sides of the tower and in straight line with the base of tower with angles of depression as 60˚ and 45˚. Find the distance between the cars. DC is the distance between cars. 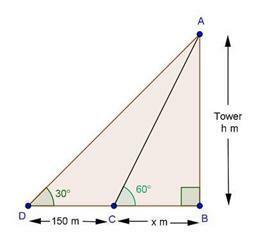 Two points A and B are on the same side of a tower and in the same straight line with its base. 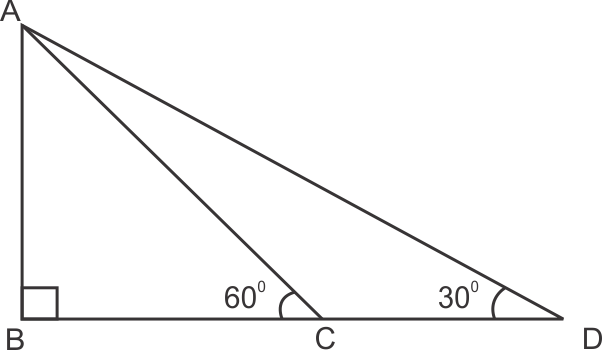 The angles of depression of these points from the top of the tower are 60˚ and 45˚ respectively. 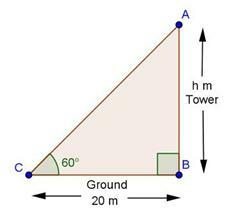 If the height of the tower is 15 m, then find the distance between these points. Let CD be the tower. 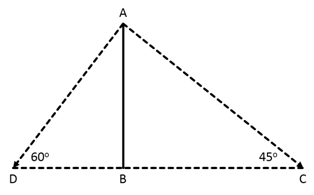 AB is the distance between the points. A fire in a building B is reported on telephone to two fire stations P and Q, 20 km apart from each other on a straight road. 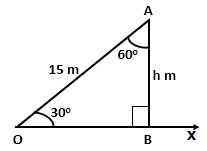 P observes that the fire is at an angle of 60o to the road and Q observes that it is at an angle of 45o to the road. Which station should send its team and how much will this team have to travel? A man standing on the deck of a ship, which is 8 m above water level. 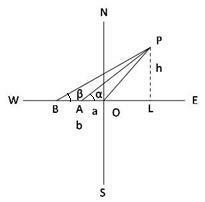 He observes the angle of elevation of the top of a hill as 60o and the angle of depression of the base of the hill as 30o. 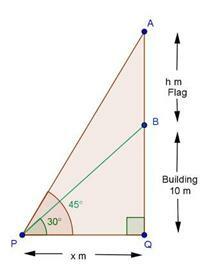 Calculate the distance of the hill from the ship and the height of the hill. 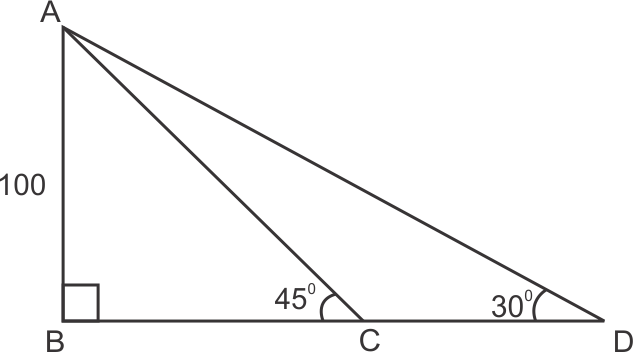 The angle of elevation of an aeroplane from a point on the ground is 45o. After a flight of 15 seconds, the elevation changes to 30o. 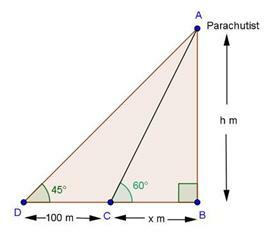 If the aeroplane is flying at a height of 3000 metres, find the speed of the aeroplane. 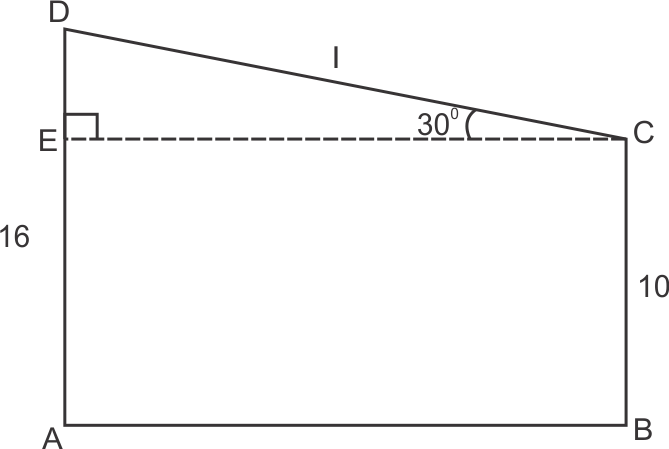 From the top of a tower h metre high, the angles of depression of two objects, which are in the line with the foot of the tower are α and β (β > α). 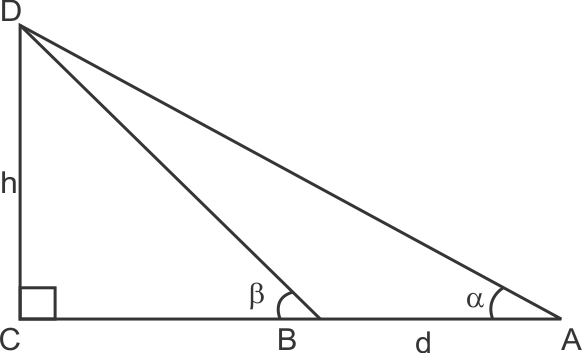 Find the distance between the two objects. A window of a house is h metre above the ground. 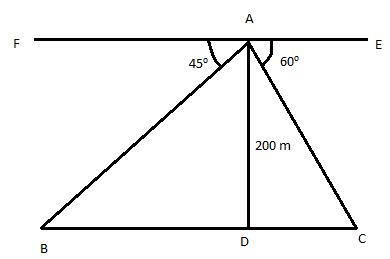 From the window, the angles of elevation and depression of the top and bottom of another house situated on the opposite side of the lane are found to be a and b respectively. 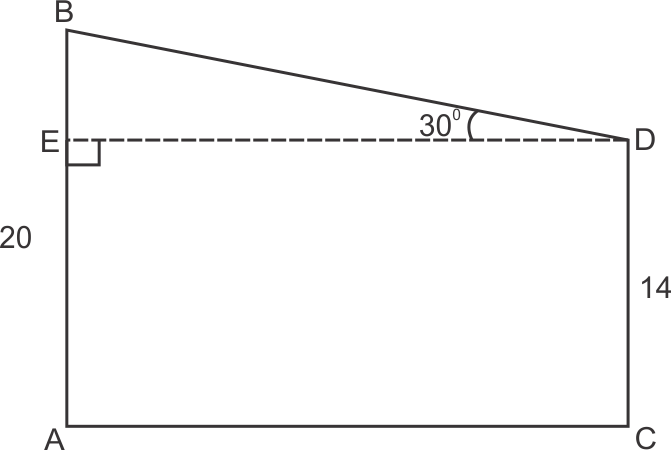 Prove that the height of the house is h (1 + tan α cot β) metres. The lower window of a house is at a height of 2 m above the ground and its upper window is 4 m vertically above the lower window. 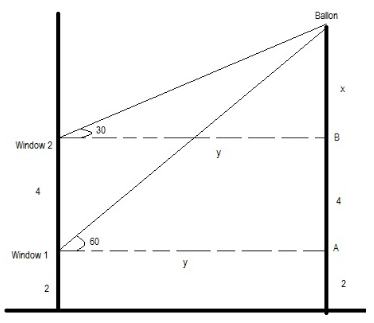 At certain instant the angles of elevation of a balloon from these window are observed to be 60° and 30° respectively. 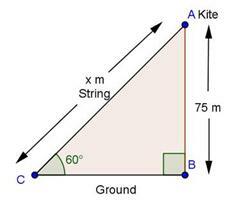 Find the height of the balloon above the ground. 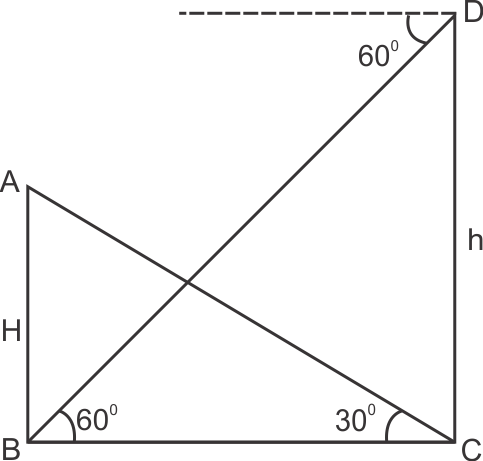 If height of one person is x then height of another one is 2x. 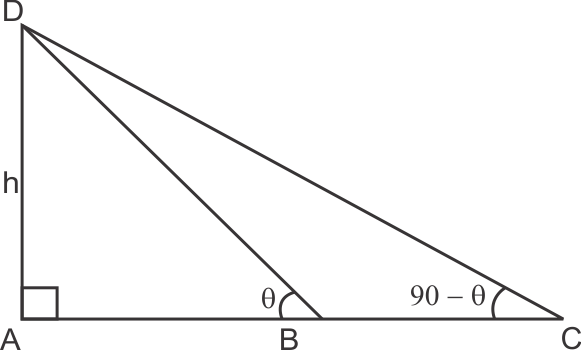 Also If angle of elevation of one is θ then for another it is 90 - θ.